Looking for a job in DeKalb County Illinois? This DeKalb County Illinois job guide is a resource for job seekers looking for legitimate employment opportunities in the region with an emphasis on government positions, top healthcare employers, public school careers, and major job boards. DeKalb County Illinois periodically posts job openings. Open positions found on this review date had included Assessment Clerk, Administrative Clerk, Director of Information Management, Maintenance Jobs, Certified Nursing Assistant CNA, Registered Nurse RN, Licensed Practical Nurse LPN, and Office Assistant. Check for the latest listings. 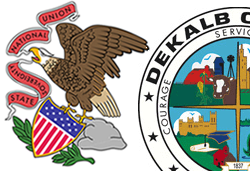 The City of DeKalb had been hiring for the positions of Code Compliance Inspector, IT Technician, Seasonal Public Works Maintenance Job, GIS Intern, and Volunteer positions. Visit their site for current opportunities. The City of Genoa may periodically post opportunities when vacacnies become available. City of Sycamore had job postings. Employment listings found included Police Officer, Superintendent of Public Works, and Part-time Custodian. Note: Healthcare employers and schools are listed lower on this page. Target Distribution Center hourly jobs include positions in administrative / clerical, asset protection, engineering, human resources, packing operations, warehouse operations, and food distribution. 3M DeKalb had a number of open positions on this review date. Opportunitie had included General Supervisor, Inventory Supervisor, EHS and Plant Engineering Manager, Weekend Warehouse Supervisor, Industrial Engineer, and Warehouse Operator. American Marketing & Publishing had open positions on this review date. Positions available included Designer, Photographer, Admin Assistant, Customer Service Associate, and Photo Editor. HyVee may periodically have opportunities in Sycamore. With over a dozen career areas, Sonoco has the perfect position for you. We're not looking for people who just want to do their job - we want innovators dedicated to taking their career to higher levels. Become a part of something greater and grow with us. KishHealth System is an excellent resource for an ongoing array of healthcare jobs and support positions. A sample of jobs found included Phlebotomist, Registered Nurse Jobs, Pharmacy Tech, Casual PRN Jobs, HomeCare Hospice Registered Nurse RN, Physical Therapist, Case Therapist, Clinical Nurse, Pharmacist, Medical Technologist, PRN CT Technologist, PRN Occupational Therapist, RN Educator, PRN Emergency Department Technician, Histology Supervisor, Part-time Med/Surg RN, Intermediate Care Unit RN, Occupational Therapist, Telemetry Nurse, PRN ED Technician, PRN Speech Pathologist, EVS Tech, Safety Companion Nurse Call Operator, Medical Surgical Registered Nurse RN, PRN Staff Nurse Job, Behavioral Health Counselor, Imaging Tech Aide, Part-time ED Technician, ICU RN, Rad Tech, Patient Access Specialist, Respiratory Therapist CRRT, Med Surg Nursing Jobs, PRN Ultrasound Tech, Social Worker, Administrative Specialist Behavioral Health, and Food Service Worker. Kindred Hospital Sycamore is a 69-bed transitional care hospital providing specialized long-term acute care to medically complex patients requiring continued care and extended recovery time. Kindred Hospital Sycamore had a number of healthcare and support staff positions on this review date. Openings found included Full-time Registered Nurse RN, Nursing Supervisor, Certified Nursing Assistant CNA, Environmental Services Aide. DeKalb County Nursing & Rehabilitation Center has open positions posted on the county site. Here there are periodic listings for Certified Nursing Assistants, Community Life Coordinators, Licensed Practical Nurses, Registered Nurses, and support staff jobs. Greater Elgin Family Care Center provides quality, affordable health care for all, including those without the ability to pay. Greater Elgin Family Care Center has positions available for Full-Time, Part-Time and PRN at various locations and counties in Illinois to include DeKalb County. During review GEFCC was interviewing for the positions of Billing Specialist, Clinical Director, Dental Assistant, Dental Hygienist, Dentist, Family Practice Physician, LCSW/LCPC, Medical Assistant, Nurse Practitioner, OB/Gyn Physician, Pediatrician, Phone Ops, Physician Assistant, Psychiatrist, and Receptionist. Grand Victorian of Sycamore is a part of Senior Lifestyle Corporation that employs dedicated staff members who are passionate about their jobs and care for every resident like family. Business Office Manager, Server-Full Time, Licensed Practical Nurse (LPN), Registered Nurse RN Weekends, Certified Nursing Assistant (CNA) Assisted Living, Cook, and Server. Bethesda Lutheran Home provides an array of services that include homes, day programs, employment supports, faith supports, camps and educational supports to people with intellectual and developmental disabilities. Home Bound Healthcare periodically hires Home Health Aides HHAs, Therapists, Nurses (RNs, LPNs), Receptionists, Homemakers, Caregivers, Social Workers, Certified Nursing Assistants CNAs, and other support positions. Pine Cares Rehabilitation & Living Center accepts resumes and posts employment listings when vacancies exist. Oak Crest DeKalb Area Retirement Center employs more than 220 full and part-time employees in the areas of Administration, Admission, Food Service, Housekeeping, Maintenance, Nursing, and Resident Services. Medical Outsourcing Solutions - Midwest Imaging Consultants was hiring for the positions of Nuclear Medicine Technologist and Ultrasound Technologist. MIC & MOS techs are independent professionals who are committed to providing customers with the very best in image quality and patient care. DeKalb CUSD #428 had employment listings on this review date such as Scholastic Bowl Coach, Various Coaching Jobs, Interventionist, Social Science Teacher, Custodian Job, Special Education Teacher, Special Education Resource Teacher, Instructional Assistant, Elementary Teacher, Home School Liasion, Annually Employed Substitute Teacher, Substitute Cook, Substitute School Nurse, Elementary Substitute Teacher, Substitute Custodian, Security Assistant, Tutor, Language Tutors, HRIS Compliance Analyst, and more. DeKalb County Regional Office of Education is a great resource for a variety of ongoing employment opportunities. Openings found had included Elementary Bilingual Interventionist, Tentative Long Term Kindergarten, Elementary Bilingual Interventionist, Teacher of the Deaf and Hard of Hearing, Custodian Jobs, Early Childhood Career Tech Ed Teacher, Social Science Teacher, Custodial Positions, Health Occupations Clinical Instructor (CNA certification class), High School Driver's Education Teacher, Foreign Language Teacher, Spanish Teacher, Part-Time CNA Instructor, PE Teacher Job, Events Custodian, Math Teacher, School Custodian, 6th Grade Classroom Teacher, Fifth Grade Math Teacher, Reading Teacher, FTE Teaching Jobs, Instructional Assistant, Special Education Teacher FTE, Special Education Teacher, Elementary Special Education Teacher, Teacher of Visually Impaired, Supported Employment Specialist, School Nurse, Sign Language Interpreter, Paraprofessional, School Psychologist, Registered School Nurse, Substitute School Nurse, Reading Paraeducator, Safety Monitor, Primary Language Tutors, Special Education Paraprofessional, Instructional Assistant, 5th-8th grade special education aide, Substitute Bus Aide, School Bus Driver, and Bus Route Driver. Sycamore CUSD #427 hire for Licensed teaching positions, administrative positions (district office administrators, building principals, assistant principals, and deans), Coaching positions, transportation, clerical staff, paraeducators, lunchroom supervisors, and technology assistants, as well as positions that provide temporary support to teachers, support staff, and students. Genoa Kingston Community Unit School District 424 had open positions such as School Psychologist, Educational Support Personnel, and Bus Driver. Hiawatha Community Unit School District 426 was hiring for the positions of High School Driver's Education Teacher, Registered School Nurse (part time), Substitute Bus Drivers/Trip Drivers, Substitute Bus Aides, and Substitute Cooks. Hinckley Big Rock Community Unit School District 429 had open positions for Part-Time CNA Instructor, Mathematics Teacher, Custodian, HS Special Education Paraprofessional, and Cafeteria Monitor. Indian Creek Community Unit School District 425 had listings for Middle School Cheerleading Coach, Tentative Long Term Kindergarten FMLA, HS/MS Spanish Teacher, Foreign Language Teacher, Anticipated 6th Grade Classroom Teacher, Para-educators and Custodians, Food Service Prep and Service, Instructional Coach, and Bus Drivers Needed. Kishwaukee Education Consortium KEC had openings for Early Childhood Career Tech Ed Teacher and Health Occupations Clinical Instructor (CNA certification class). Northwestern Illinois Association's open positions found had included Job Coach, Occupational Therapist OT, Physical Therapist PT, Paraprofessional, Program Supervisor Therapy Department, Assistant Program Supervisor OT Therapy Department (West), Speech Language Pathologist, Substitute Educational Sign Language Interpreter, and Teacher - Deaf and Hard of Hearing. Additionally, the NIA hires a variety of professionals for its organization: Audiologists, Adaptive Physical Education Teachers, Hearing Itinerants, Paraprofessionals, Secretarial and Clerical Staff, Teachers of Students with Orthopedic Impairments, Teachers of Students with Multineeds, Vision Itinerants, and more. Sandwich Community Unit School District 430 had employment opportunities posted during this review. Visit their site for current listings. Somonauk Community Unit School District 432 provides instructions and links to their employment application portal. Sycamore Community Unit School District 427 hires for Substitute Positions, Support Staff Positions, Licensed Positions (teacher, guidance counselor, social worker, psychologist, and others), and Administrative Positions. Northern Illinois University posts a variety of opportunities ranging from faculty positions and administrative and professional jobs to student on-campus employment and extra help positions. Kishwaukee College serves students of the entire Northern Illinois region. Here you will find a variety of instructional and support staff jobs. DeKalb County Economic Development Corporation provides resources and data such as Labor Market & Workforce information and top ten employers. Whether you're relocating, visiting, living or working in the DeKalb area, let the DeKalb Chamber help make your experience even more enjoyable. The DeKalb Chamber is a good resource for identifying local businesses through the member directory. The Daily Chronicle's jobs section is a popular portal. Monitor the State of Illinois web-based electronic hiring system for job openings in DeKalb County. This Worklooker directory includes Aurora area top employers. Featured listings include Presence Mercy Medical Center Aurora, Elgin School District U-46, Rush-Copley Medical Center, West Aurora School District 129, East Aurora School District 131, Kane County Sheriff's Office, Daily Herald Classifieds Jobs, Rockford Chamber of Commerce, Rock River Valley Entrepreneurship Center (RRVEC), and more. This Worklooker directory includes Rockford area top employers. Featured listings include The Rockford Health System, Rock Valley College, OSF Saint Anthony Medical Center - Rockford, Rockford Memorial Hospital RMH, Rockford University, Rock Valley College, Winnebago County Sheriff's Office, and more. This Worklooker directory includes Oswego area top employers. Featured listings include Caterpillar Aurora, Menards Distribution Center in Plano, City of Yorkville, KishHealth System Valley West Hospital - Northwestern Medicine Jobs, Edward-Elmhurst Health Center Oswego, Newark Community Consolidated School District 66, Oswego Community Unit School District 308, Plano Community Unit School District 88, Kendall County Record | Kendall County Now | Classifieds Employment, and more. This Worklooker directory includes top employers including Centegra Memorial Medical Center, McHenry County College MCC, McHenry County Public Schools, and more. This Worklooker directory includes Ottawa - LaSalle area top employers. Featured listings include Eakas Corporation, Carus Corporation, Super Walmart Careers, Peru Mall, OSF St. Paul Medical Center, St. Margaret's Hospital, Regional Office of Education La Salle, LaSalle Job Market Information, and more.